1939 was not a great year for the Canadians. Rationing was strictly enforced. But tham thar Canadians were a tough bunch, and Muskrats were already being trapped for their fur. Besides, they were good enough for the indigenous peoples, so that was good enough for the average Canadian in the early years of the last war. In 1939 an estimated one million muskrats were being trapped for their fur. Best of all they were not rationed. This article from an Ottawa newspaper dated April 26th 1939. Ottawa, April 26 lect .-(CP)-A select few Canadian epicures-there will be more soon-love their meat but look on meat rationing without dismay. If one-third of the muskrat crop is marketed for food this year, the Canadian meat supply will be increased by about 1,000,000 pounds, as the average dressed weight of the “marsh rabbit” is about one pound. The flesh is dark red in colour but fine grained and tender. . The enthusiasts say the carcass should be soaked overnight in a slightly salted cold water to develop the best, flavour. This done, the favourite recipes call for muskrat fried, wine-fried . smothered in onions, potted or baked, shredded, German style, and stewed. Wild life conservation officials look on increased use of muskrat meat with more peace of mind than they could have in respect to most other wild animals. Muskrat farming has become common in many marsh areas. and trappers who have taken more than they could eat themselves often have been forced to discard the flesh. “There appears to be some wastage of good meat which should be avoided if at all possible at a time when meat supplies generally are short,” one authority said . One muskrat meat purchaser said he had an arrangement with a trapper to ship him muskrat carcasses in dozen lots during the trapping season, and, with shipping costs included, the price ran about $1.60 for 12 pounds of meat. The trapper dresses the meat after he has skinned the muskrat. 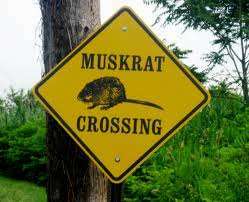 WHAT EXACTLY IS A MUSKRAT? They are kind of pretty actually. A small rodent that lives in swamps and builds beaver-like houses. They are semi-aquatic and not really ‘rats’. They belong to the species of voles and lemmings. They are not big, but they are one of the biggest of their species, being about 1.5 to 4lbs in adulthood. During the Great Depression, (and it may be an Apocryphal story) is was said that the Bishop of Detroit, bowing to pragmatism and compassion for the starving, declared Muskrats to be fish. His argument, it seems is that because Muskrats live in water, then they may be described as fish, and can therefore be eaten on Fridays. Wouldn’t it be a lovely story if true? WANT TO TRY A MUSKRAT RECIPE? Pat Carstensen Bell Communications Research, Inc., Red Bank, New Jersey, USA. It is apparently a very easy recipe to prepare once you have obtained your elusive Muskrat. pepper together for 10 minutes. with tomato soup. (Don’t add water to the soup. 4) Bake, covered, for 21/2 hours at 175 deg. C or until done.